You both play very intriguing characters in ‘Laal Kabootar’, tell us about what your process was like getting into the skin of your respective roles? Ahmed: You do not usually get a lot of time to rehearse, but Kamal Khan was very particular with that. I’d auditioned almost five-months before we began shooting and it started with a lot of conversations back-and-forth. Kamal will sit you down and talk about life, the struggles he has had and try to extract a vulnerable part of you in order to give yourself completely to the director. In the hindsight when I think about what this lead to was how I ended up relating to Adeel. Next, it was observing how people behave in Karachi, it’s a fast-paced city, people are hustler and street-smart, but Adeel wants to escape that. We in fact spoke about relationships that aren’t shown in the film, for instance Adeel was closer to his mother but you won’t see that. The little bit of conflict I’ve always had is that I’ve wanted to do something bigger and better, so what I resonated with was that Adeel was unhappy with what he had, and I had to channel that. I wouldn’t take a direction where it harms lives of course, but he’s ruthless. And so there was a lot of introspection, it’s internalisation, but also bring together the outer most layer of myself, how I talk, why I have a moustache. Kamal again was someone who knew the pace and tone of the character, which is something I understood after doing it over and over. Even with scenes, we improvised and that forces you to remain in the character and see where you can take it. Mansha: I think what appealed to me was my character, it has a great arch in the story, from where she starts off to what happens towards the end, and it’s a proper journey. During rehearsals, we kept dissecting and reconstructing, and rebuilding the character until we knew what she was really about, and we changed it in the process. During the process, it was a lot of Kamal and what he thought of how she would react. He was very specific about that. To me, it was just an ongoing process, he would throw you off-course and ask you to do something while in-character, and I just held onto that main crux and built onto that as we shot. ‘Laal Kabootar’ is also seemingly an offbeat film, comparatively; do you feel an independent project like this is commercially viable? Ahmed: It’s absolutely a commercial film; I think there are a few factors that narrow your audience if it has slightly mature content. The reason we usually play safe in our love-stories and comedies so it is to be able to cater to a larger demographic. 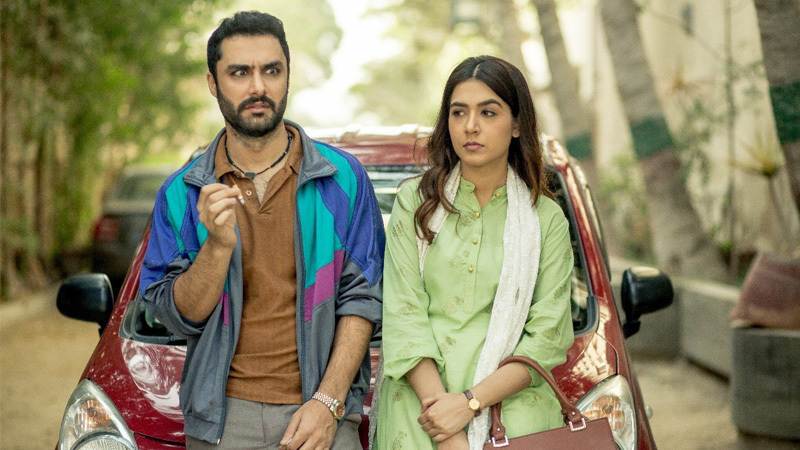 But ‘Laal Kabootar’ has a great story and plot-twists that we could’ve used during promotions, but wanted the mystery element to remain, it also has very relatable characters and a great soundtrack. I think we didn’t reveal a lot in the trailer because that just ruins the viewer’s experience, but it does have everything. Mansha: In Pakistan, we do try to play it safe, but I think after a certain point, you do need to branch out. With all the other films that are coming out, for instance ‘Baaji’ I’ve heard is also a thriller, it’s a murder-mystery, so slowly and gradually, we need to realise that even the audience gets saturated. ‘Laal Kabootar’ isn’t an experimental film, it’s very mainstream, edgy, thriller; it’s like saying ‘A Quite Place’ was a niche film. I see this as a good testing ground for newer things and at the end of the day, there are different genres and they don’t define whether a film is commercial or not, look at Hollywood. As actors, the two of you have also not taken the conventional path of playing the leads, but have been open to all sorts of parts. Do you feel that typecasts you as character-actors only? Ahmed: I think ‘Laal Kabootar’ is evidence that it hasn’t typecast us. I think it has a lot to do with who you are and how people see you, regardless of whether you’re the lead or not, they watch what you put out and so you have to break it, keep pushing the envelope. I haven’t tried in putting any catalyst in my career, I’m not an actor for the next two years, but for as long as I live, which is why I’m open to any kind of character or story, which I enjoy when I read and want to tell. Mansha: I’ve gotten offered leading characters in the past where I’ve found them boring as compared to the supporting characters. If your work stands out, there’s no stopping. To a certain extent, I think every actor is typecast, Mehwish Hayat and Mahira Khan have been typecast as certain girls, and I think that’s what comes with being an actor, I’m labelled this very serious-actress. I, for one, make choices that agree with how I wish to see my career. Unfortunately, in Pakistan, there is this mindset of a ‘leading actor’ and filmmakers do that too, they end up concentrating on one character more than the other. Mansha, you play a very fierce woman Aliya in the movie. Over the years, how do you think characters for women have evolved and do you see greater substance today more than ever? Mansha: I think where characters and societies are going and how the two are reflecting one another; it’s an ongoing debate in my head as well. I do feel that strong characters are always written but aren’t given that space because the damsels sell more. Even at points where you feel the character doesn’t have to be so bechari, the makers will turn up the bechari-metre up to the highest. And that also has more to do with the perception of women beyond cinema and TV. How many times has one seen a man cry on-screen? I want to see that; the angry-young-man is preconceptions in society too. Television does have a way of re-establishing and harnessing these theories, but with my character, it isn’t like she doesn’t cry, but that doesn’t mean she isn’t strong. I like that grey and that is how people are. Now, more than women, I think men need to be asked what they feel about their characters. I believe that there’s immense stereotyping in both the genders. It’s important for men to emote, the conversation needs to shift. It’s a cycle, when you have a story with a sensitive male, you will have a strong female, I don’t know, it’s a weird equilibrium. Ahmed’s the more sensitive one in ‘Laal Kabootar’ for instance. Lastly, through your own experience with cinema, talk about what you make of the current state of the industry and how do you think it has evolved? Ahmed: When I look back, I had done ‘Siyaah’ in 2012 and so I’ve been in some ways, a part of the rebirth. It’s great; we’re learning and slowly, but steadily improving. For the business aspect of things, we need to go back to the drawing board. The amount of cinemas we have and all of that, we need reconstruction. As far as stories go, this is how we’ll learn; even Bollywood in the 1990s had a very weird trial and error. Mansha: What I like about cinema is that there are people who like certain films, but there’re also those who are conversing about what they didn’t like and I like that conversation. I think even with Wajahat Rauf’s web-series it opened a door to people voicing their opinions. There is progress and that’s the point to focus on. This year we have 20 films coming out and that’s amazing. From a realistic point of view, think of an industry completely dead with no structure whatsoever not too long ago, we’ve managed to pull a rabbit out of the hat.